Governor Ginny Gotlieb was re-elected for a two-year term at First California Company’s 2012 Annual Meeting on June 30 at Sarducci’s Capistrano Depot Restaurant in San Juan Capistrano. 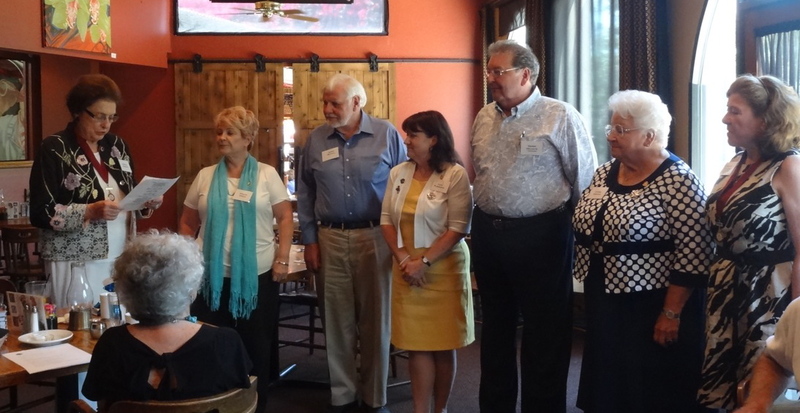 As our other new officers, the members elected Donna Derrick, Lieutenant Governor; Julie Plemmons, Secretary; Harry Holgate, Treasurer; Martha Gresham, Chaplain; Phyllis Kinzle, Registrar and Membership Chair; and, Jim McCall, Historian. Former Governor Joanne Murphy was elected Councilor; the remaining Councilor seats are vacant. Eleven members were present, as was one prospective member. We also had six Friends and guests. Harry Holgate and Phyllis Kinzle reported on the Southern California Genealogical Society’s Jamboree on June 8-10 in Burbank. Martha Gresham reported on the Escondido Family Fair in March (see our March 3rd post). Governor Gotlieb reported on the Jamestowne Society May 12-13 meetings in Williamsburg (see our post of June 1st). The Society is recruiting a new executive director. 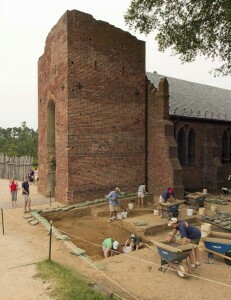 The 17th century bell tower, Jamestown’s sole remaining structure, is in critical need of repairs and maintenance to avoid collapse and serious impairment as the entrance to the 1907 Memorial Church. Mortar is missing, the original bricks are falling out (creating a danger to visitors) and plants are growing in its interior. The Society has agreed to help raise funds from members and companies to assist Jamestown Rediscovery and Historic Jamestown make the needed renovations. The estimated cost is $150,000. FCC members voted to contribute $500 to this project from the Company. We will be posting more on this in the coming months. Look for additional information in the next Society newsletter and on the Society website. Donations may be sent to the First California Company (Harry Holgate, Treasurer, 115 West 4th Street, #208, Long Beach, CA 90802-2312) or directly to the Society. Indicate that you are affiliated with the First California Company and that the donation is for the Jamestown Church Tower Restoration project. The Society has a dedicated capital fund account for this purpose. Treasurer Harry Holgate presented the 2012-13 budget, which was then approved. Lieutenant Governor Donna Derrick is chairing a by-laws review committee that includes Martha Gresham and Jim McCall. Historian Jim McCall is revamping the Website and blog. 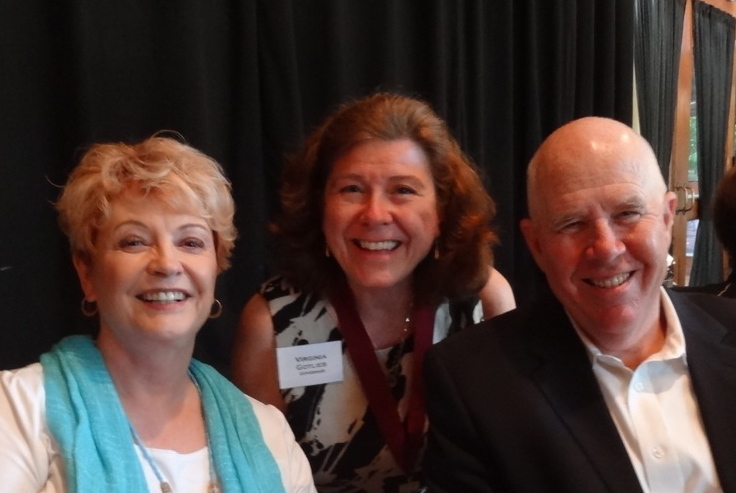 Governor Gotlieb noted that the Golden State Company received its charter from the Society at the May 12 meeting (see our June 1st post). Cathy Matranga is the organizing Governor and Santa Barbara is noted on the charter as the Company locus. A new Northern California Company is also being organized (see our June 1stpost.) It expects to receive its charter in November and has scheduled a meeting of charter members for Saturday, October 20 in Berkeley. Our next meeting will be at the San Diego Yacht Club on Saturday October 20. It will feature a presentation about Stephen Hopkins, the early settler who first arrived in Jamestown in 1610 among the Sea Venture castaways that had been shipwrecked on Bermuda in 1609-10, then returned to England before 1617 and came back to America on the Mayflower in 1620. Friend Bev Nickerson will join Kenneth Whittemore, Jr. to discuss Hopkins’s life after Jamestown. Whittemore is Governor of the General Society of Mayflower Descendants in California and is also on the board of the General Society of Mayflower Descendants, headquartered in Plymouth, MA. Membership Chair Phyllis Kinzle proposed that we hold our January meeting in Los Angeles at the Magic Castle and will make arrangements. Ideas for future programs were solicited and discussed. If you have suggestions for our program topics, outings, speakers, or venues,please contact Lt. Governor Donna Derrick.